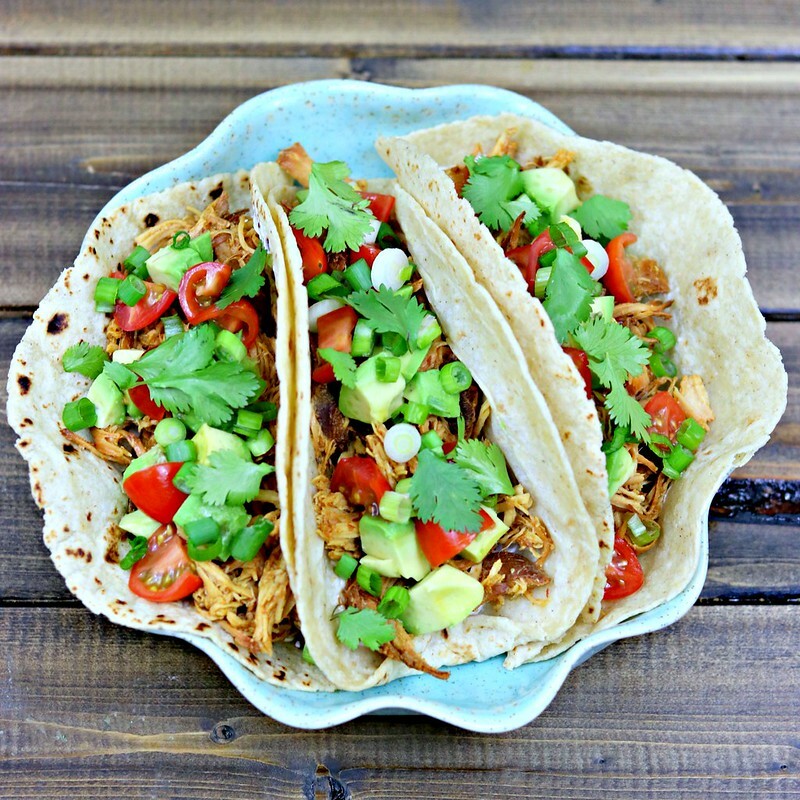 Slow cooked, with sweet and spicy notes, these Honey Chipotle Chicken Tacos take the guesswork out of weeknight dinners! Slow cookers (aka crock-pots) are just really one of those small kitchen appliances that I’m not sure how anyone lives without. I mean, I probably didn’t use one very often until about 3 years ago, but now…I can’t imagine not having and using one regularly. For a busy, working mama that wants a good home-cooked meal on the table every night, it just makes it easier some nights. You come home, and the main part of your meal is done. Maybe you need to whip up some sides, or some toppings, but the bulk of the work is done. I don’t know what your schedule is like, but for me – that’s everything. 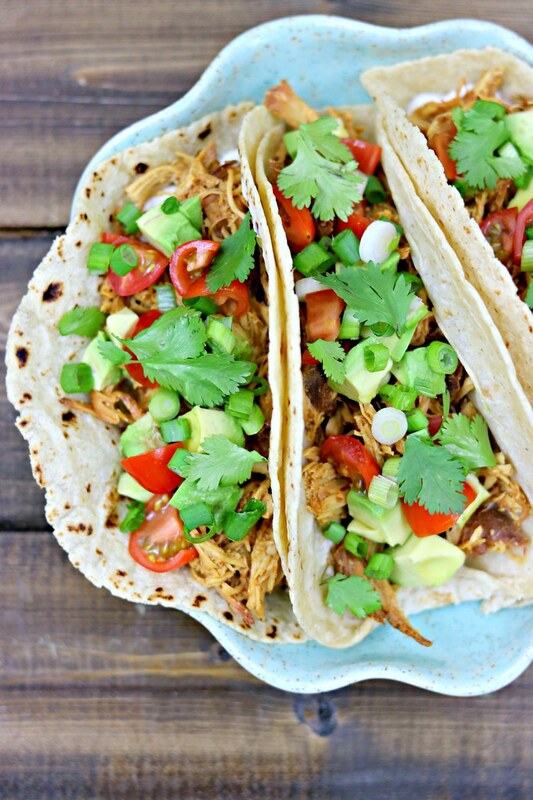 And when the result is something like these amazing honey chipotle chicken tacos…well, how much more convincing does one need?!? I love spicy food. I mean, borderline obsessed with it. Okay, maybe way past borderline. But really. I love it. And when you add a bit of sweetness, like honey, it’s the perfect balance. Now granted, if I’m in the mood for burn-your-face-off spicy food, then keep that sweetness away. But on a normal day, when I just want to enjoy a bit of heat, but also make something my toddler can eat and enjoy, this is the way to go. And, as with most recipes, the amount of heat can be adjusted to your individual taste by adding a little more or a little less chipotle. I usually go mid-range on recipes so it is tolerable as-is for most. Granted, I have some friends who think ketchup is too spicy, so if you’re like that…less is more, for you. Life has been a bit more chaotic the past six weeks that it has been in a long time. Right after #BrunchWeek, we had some staff changes at work that meant more work for me, temporarily, so I just didn’t have much left in me at the end of the day. It’s a miracle I still got dinner on the table every night. Well, most nights. But things have started to calm down now, and the extra responsibilities that I was helping out with are just about off my plate entirely, so my overall schedule is starting to get back to normal as well. That means that recipes like this one, that I’ve had waiting in the wings, photographed and ready to go, are finally be shared! I think next I’ll have to try this in the Instant Pot that J bought me for Mother’s Day. I’ve used it a few times already and it’s been great, but I haven’t tried to convert any of my existing recipes over yet. People do seem to love the Instant Pot, don’t they? I don’t think I’m quite on the “it’s the best thing ever on the face of the Earth” bandwagon, but I do like it and it comes in handy sometimes. Who knows though, the more I use it I may come to be an Instant Pot fanatic, too. For today, though, I’m still a huge fan of my slow cooker. And these amazing tacos that came from it! Place chicken breasts in the bottom your slow cooker/crock-pot. Place the chipotles, honey, garlic, Worcestershire, and black pepper into a bowl, and stir to mix well. Pour the sauce over the chicken and cook on low for 4 hours, or high for 2 hours. 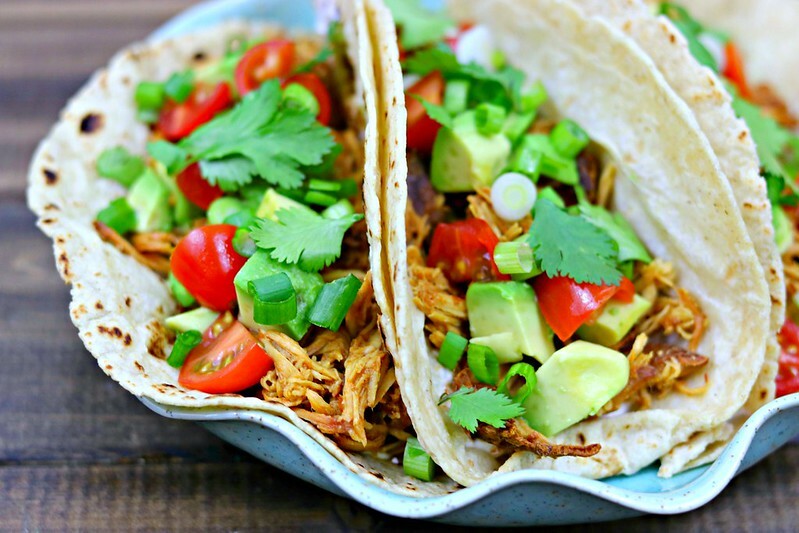 Use two forks or a pair of tongs to shred the chicken right in the crock-pot OR remove chicken to the bowl of a stand mixer and shred using the paddle attachment on medium-low speed, then return to the crock-pot and mix with the liquid. 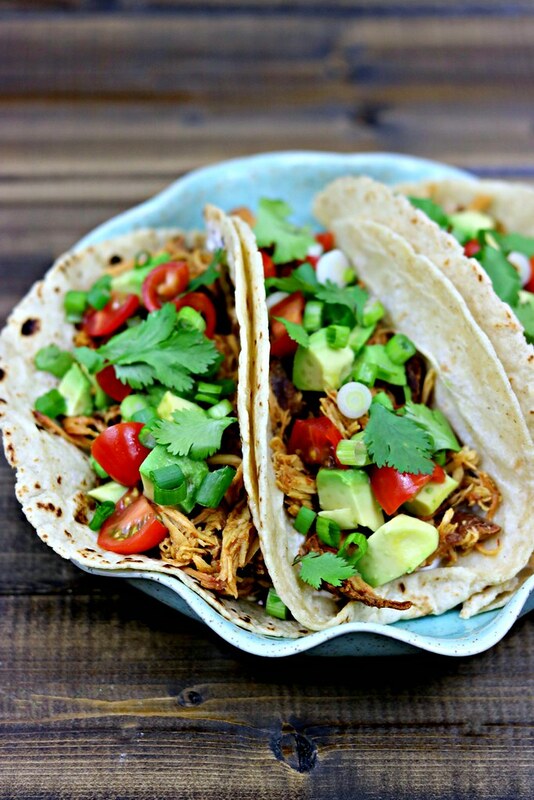 To assemble the tacos, warm your tortillas and then top with a smear of sour cream, shredded chicken, tomatoes, cilantro, green onions, and avocado. *Add less chipotle if you are not into spicy food. Add more if you love it!